wanderlust ATLANTA: ATLANTApix: "The Dump"
Margaret Mitchell, who passed away on this date, August 16, in 1949, affectionately called her Peachtree Street apartment "The Dump." Margaret's apartment, where she wrote the Pulitzer-winning Gone With the Wind, is on the ground floor of the northwest corner of this now-famous Atlanta landmark and faces Crescent and 10th Streets (photo). The house was built in 1899 as a single-family private home. It was converted to a 10-unit apartment building in 1919. Margaret and her husband, John Marsh, took up residency in 1925. Fire nearly demolished the house in 1994 and again in 1996. 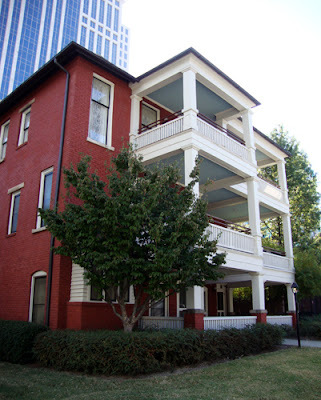 Restoration efforts, which had began in 1985, continued and the home opened as the "Margaret Mitchell House" on May 17, 1997.